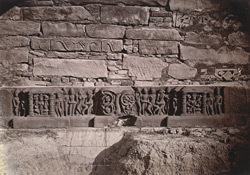 Photograph of a lintel slab from the Mahadeva Temple, Baijnath, Bihar, taken by Henry Baily Wade Garrick in c. 1881-82, from the Archaeological Survey of India Collections. The 'List of Ancient Monuments in Bengal' of 1896 published by the Government of Bengal includes the small stone temple of Mahadeva at Baijnath: 'The square elevated space on the east side of the old watercourse contains a vast variety of figures, better executed than those at Darauti. There are in particular a great many square obelisks of a different form from those at Darauti, which represent in several tiers domestic scenes. There are also numerous columns, pedestals, cornices, capitals, &c.' (pp.360-362). The lintel slab in this view is carved with the representation of Lakshmi and other figures.